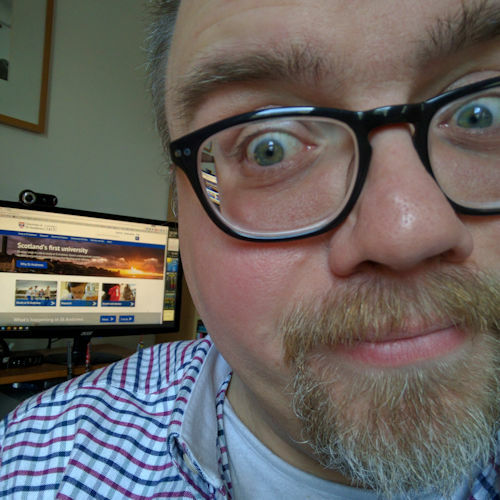 I think I must have said a couple of times in this blog that our current abode is but a stone’s-throw from our holiday cottage Kadesh. Well, here’s the proof that it is in fact right next door. The photograph above was taken this evening, as I hung out of the back window that overlooks the garden at Kadesh. 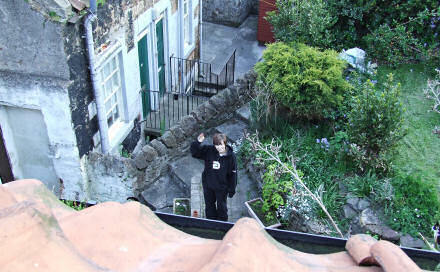 The red, tiled roof that you see on the right of the photograph is the roof of our wee cottage next door. I did take better photographs than this one, but they didn’t show the bust of Vladimir Ilyich Ulyanov or a model of a vintage London bus, which I felt added an important socio-historic perspective and sense of scale, in every meaning of the word. Technically it’s not ‘proof’ is it. It’s still just me telling you that it’s our house. Okay, how about this one? It’s of Jane standing in the garden waving to me. Surely that is conclusive proof that she owns that property. You get 10 points if you can find our cat “Spot” in the picture. Jane actually popped next door (before ER started; it’s the last one in the series, seemingly) to find Spot’s brother Smudge, who has taken to spending his days under the house or in the garden next door. He clearly knows that we intend to move back in there after the summer. 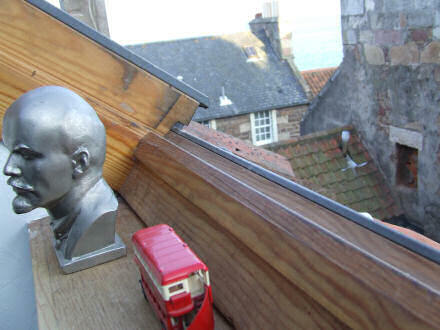 I bought the bust of Lenin in a tourist shop just off Red Square in Moscow on a school trip in 1988. I’m writing this post in Opera 8 for a change. Spot followed Jane into the garden; I think he was also concerned about his brother’s whereabouts. I have two small models of London buses. I can’t remember who gave me them, or why. I did consider starting a collection of red London buses but I reckoned how would I know when my collection was complete? So I decided that “two” was a complete collection of red London buses: one old one, and one new one. An Engineer and Mathematician were both given the task of herding 100 Sheep with the least amount of fence possible. So the Engineer wrapped the fencing tight around the sheep saying “This Constant Radius Circle is the smallest perimeter for a given area and therefore is the best solution”. It’s just a shame that the photograph of Jane herding the two cats out of the garden gate didn’t come out better, otherwise this post would likely have been less random and been titled “Pied Piper of Cellardyke”. You’ll just have to take my word that it was very amusing. And that it really is our garden next door. I spotted Spot! Very bottom right of the picture, just above the wall (if that’s what it is). How do I claim my 10 points? Ten points to James. For a further ten points can you tell us where Smudge is, and why he keeps hiding under the house? Previous Previous post: Neo-nazi pasta?! Next Next post: Viva Chris Moyles!